Not sure which portable, window or central air conditioner is right for your home or specific needs? We are here to help. You’ll find below a pretty handy chart that will help you pinpoint the right model. You’ll notice that room size and heat load are the two variables within this chart. 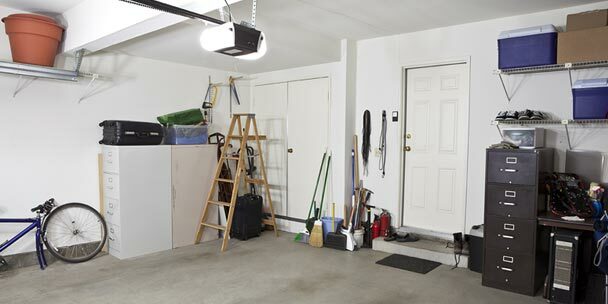 Step one is simply figure out the room size in square feet of the room you would like to keep cool. Next, figure out the amount of heat or "heat load" that the room receives. For example, if the room has a lot of windows or is next to a kitchen, that room would probably have a high heat load. Based on those two parameters, you should be able to figure out what kind of BTU range works for you. For reference, BTU is simply a designation of cooling power – the higher the BTU the more powerful the cooling. 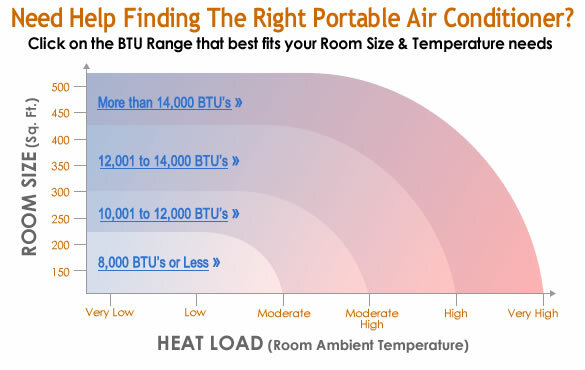 Simply click on one of the four "BTU areas" and it will lead you to a page with portable air conditioner models that will suit your room size and heat load needs. 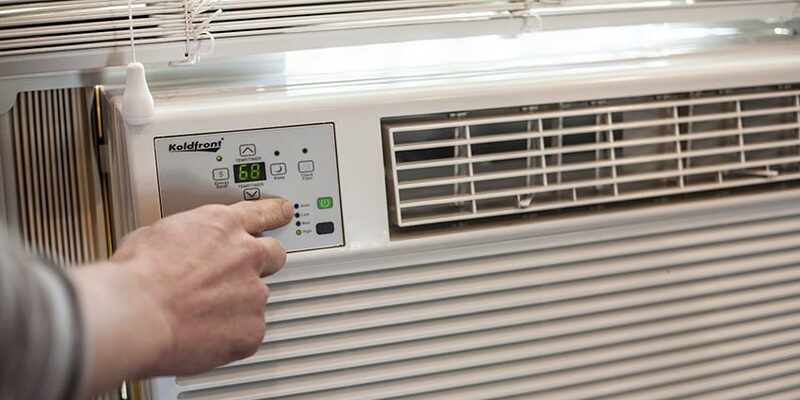 Use the dropdowns below to help you estimate what size air conditioner is best for your space. 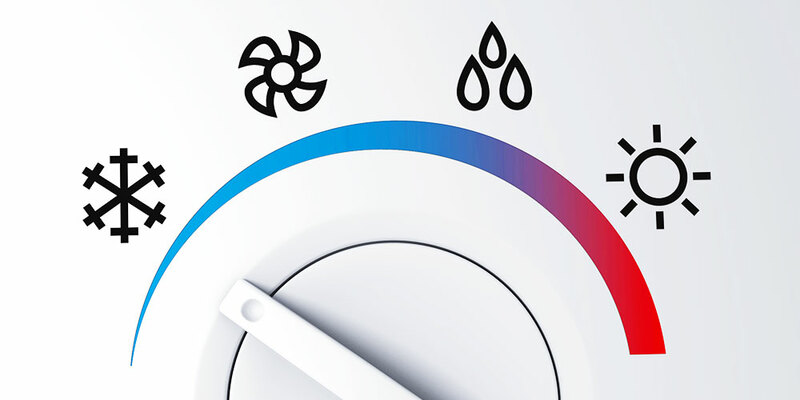 The cooling power of different types of air conditioners is based on BTU’s. We’ve rated and measured our units against a number of different room and/or home conditions that can effect the cooling power required. Use the drop-down menu below to calculate the total BTU cooling power that you will need to efficiently cool down your specific needs. Is the room in a very sunny region of the house? Is the room heavily shaded? Is the unit in a kitchen? 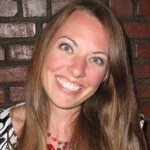 Don’t want to use the BTU calculator above? No worries. Here’s a reference chart that will give you a pretty good idea of how many BTU’s you will need, based on the total size of your room. Thank you. This information was actually pretty insightful. I live alone in a somewhat big house and there are many times I simply want to cool one or two rooms, especially my bedroom. And it doesn’t make sense to cool the entire house, just so I can sleep comfortably. I hate throwing money at the power company for rooms I’m not using. Have slider windows what a/c unit will work for me window opening is 58 1/2 × 21 600 Sq ft sun room. I recently purchased a 14,000 BTU but discovered that it would turn off each time my refrigerator turned on, so I had to return it. Would lower BTU’s work or does it have to do with the amps? Please advise, and thanks! 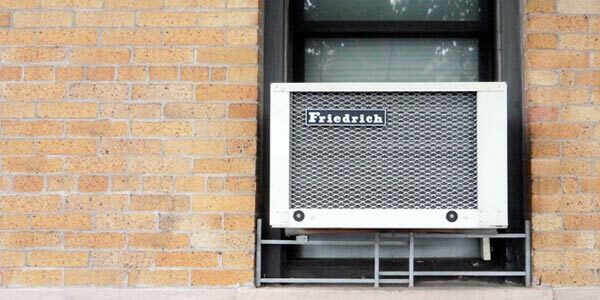 Having a smaller btu ac probably would help if it is still large enough to cool your space. The circuit which you have both of them plugged into is likely too small to handle the load of both at the same time. There may be a switch that shuts off the ac if the current draw is too large. You might be able to solve this by just plugging one of those appliances into a different circuit or just leaving the ac off until the fridge stops running. All portable air conditioners that I have researched use sq.ft. as a condition for BTU requirement. I plan to use the unit to augment the central air in my bedroom which has a high cathedral ceiling. Wouldn’t volume be a better criteria than area? My son, an architect, recommended adding 50% to the sq.ft. I have a 14×17 foot sunroom 6 sliding glass doors and too large triangle windows up high, no insulation it is on the south side of house will this unit cool my room? Hello there, can any one help me.I have an airconditioner, but dont know what the BTU is on it. 1 horsepower hp = 2,544.43 btu per hour btu/h. Calculators work better for me! How much BTU cooling is required for Dell 530 server having power consumption of 750 W .
As per my calculation with least 60% efficiency it will be 2577 BTU/hr . it will depends how many people entering on that room and consider also you isolation or sealed is that room and if it shaded or sunny area. i think 15000 BTU is too big remember that when your machine was too big it will cause high electricity bills and due of switch off and on of your machine. What would you recommend as a replacement roof AC on a 1978 Spartan park model. 8×33, 2 people, skirted in full AZ. sun. Sweet. I was just looking at your window units and scratching my head to what siZe I needed. My fruits cold room is 11.6m W x 5.8m D x 3.5m H. Can you help to calculate how many HP or BTU shall it needed? It helped me a lot to understand BTU range..
And the BTU calculator was a bonus. How many but for a 3 bedroom ranch to cool down the whole house? How many BTU do I need to cool down 3 bedroom ranch? 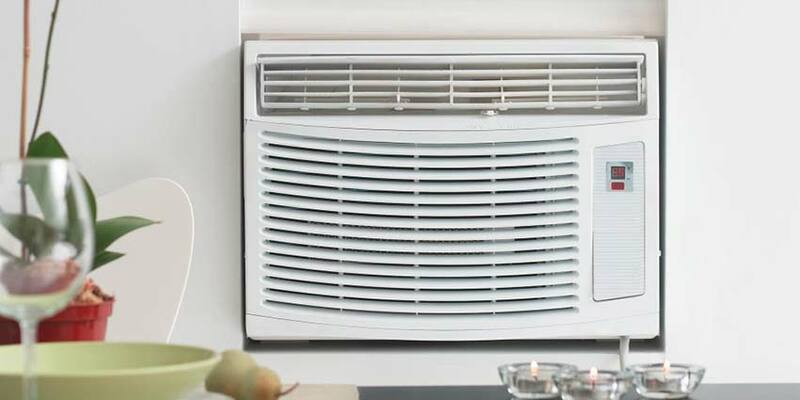 I can’t currently afford central air or even a used portable unit over 14000 BTU’s but what I’m wondering is if a 13000 BTU unit will at least take the edge off in my 570 sq ft living room/kitchen combo with high (12ft) ceilings in a very sunny location. Maybe it won’t ever be cold or cool but if it could at least be more comfortable than 85 degrees, I’d be happy. I live in an apartment with my husband. Two bedrooms and bathrooms upstairs, kitchen and living room downstairs. 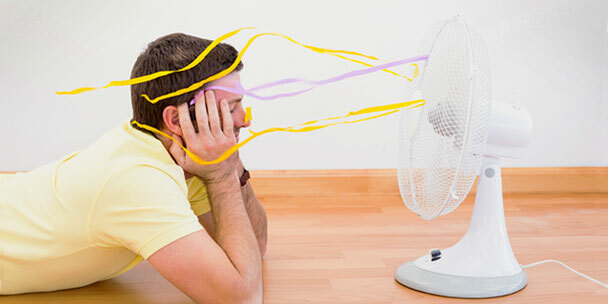 I just want one ac unit to cool off the entire apartment. How many btu’s would I need? A parameter to add to the BTU-age calculator would be to include “Are you up north or down south?”. If you use it as-is up north, 3 days of 95F will tax it, but is temporary. But 3 MONTHS of 95F is a different matter – and will kill the poor A/C unit in short order. For down south, you’d want to take the result and multiply by a good 1.5 so the compressor isn’t going 24/7 during the 3 month hot spell. And if the units to choose from are not exact, go with the bigger one for the reason above. What is the capacity of Panasonic CS/CU-A 9 PKH? Is this good enough for a room size 12ft by 10ft? The manual does not give capacity of the air conditioner.